We all understand the value of international trade, the laws of comparative advantage, economic growth, wealth increase, etc. The United States of America even sent Commodore Matthew Perry to Japan in 1853, with gun boats, to force Japan to open its markets and begin trading with the USA. President Millard Fillmore, who sent Perry on that mission, had no idea that such a move would lead to a flood of Toyotas beginning a little over a hundred years later. International trade is important to the USA. 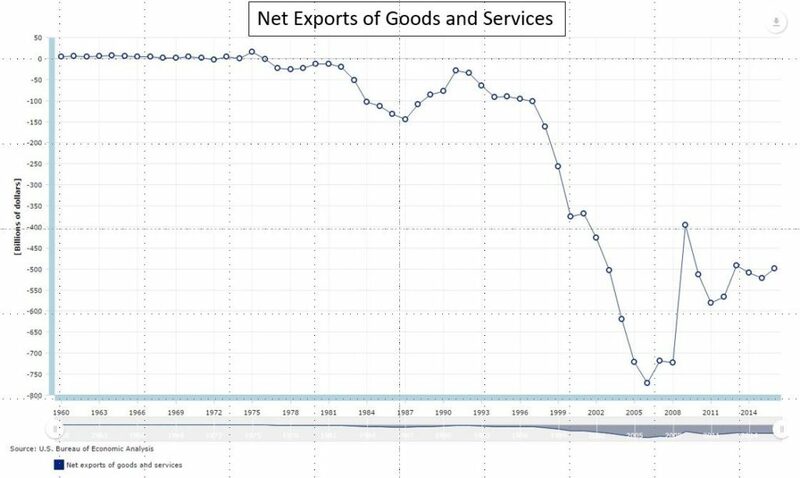 Exports account for 12% of our GDP, while imports equal about 15%. That difference, about 3% of GDP, running a little over $500B per year for the last three years is the boot we are having to pay. And that is the critical trade issue we are facing. The value of our exports, the stuff we are trading in, is far short of the value of our imports, the stuff we are receiving. The unfavorable imbalance started in the 1970’s, about the same time that GDP growth slowed, middle class job opportunities and compensation stopped increasing, and our national debt as a percent of GDP began a relentless increase. There were several causes: end of $3 per barrel oil and the rise of OPEC, recovery of Japan and Germany from WWII, rapid increases in rates of automation and globalization, and rise of developing economies led by China and India. The bottom line is that the USA lost its monopoly on the global economy, a monopoly that had resulted from victory in WWII without having suffered destruction of its production capability and infrastructure. So, now that we have the root cause of our various economic problems, negative balance of trade included, the question is what actions should be taken. Our strategy for forty years has been to borrow money and increase debt and social spending. It has not worked. President Trump wants to jack up tariffs to correct the trade issue. That is just another tax increase. At the same time he wants to cut corporate taxes. All that is just destructive tinkering, hurting a little in one case and helping a little in the other, solving no problems but just creating problems and discomfort. This may be a difficult concept to buy into, but the simple fact is that corporations do not pay taxes. The corporate response to tax bills received is to pass them along in the prices of their products. Consumers always end up paying all such taxes. Corporate taxes and tariffs may determine whether a company stays in business and which products it chooses to make, but, unless the consumers are willing to pay prices that cover the tax bills and also provide a reasonable return on invested capital, the business, or certain products of the business, will cease to exist. Corporations may spend a fortune lobbying for favorable tax treatment to help it be more competitive, but the goal is staying in business and growing the business rather than just increased profits. So, if I were President Trump, I would be pushing for elimination of the corporate tax and elimination of all tariffs on imported goods. I would do that believing that the result would be a “yuuge” increase in business investment and production, an elimination of corporate lobbying for favored treatment, a “yuuge” increase in personal incomes and employment and resulting tax revenues, a scrambling of foreign companies to establish manufacturing here, and a reversal of all the unfavorable trends that have been in place since the mid 1970’s. Another reason for eliminating the corporate tax is that it is extremely unfair, some large corporations paying almost nothing and others, including most small corporations, being subjected to the maximum 35% rate. And those differences depend only on the favors granted by Congress in the forms of exclusions, credits, deductions, and exemptions. We have a terribly convoluted and unfair system. As part of the package, I would insist on no longer giving dividends and capital gains special treatment and to tax them as ordinary income. That would be a “yuuge” simplification of individual tax codes and would encourage people to stay invested and to reinvest in businesses. Ordinary investors would quit worrying about timing of purchase and sale of securities and just buy and hold. Wealthy investors would tend to buy stocks that focus on growth rather than on dividends. The strategies of businesses and individuals would shift from fiddling and finagling to trying to adopt and execute the best strategies based on pure economics. An important issue to consider, even if one believes it is a good long term plan, is the immediate impact on the federal revenues of such a change. Well, the simple fact is that corporate taxes only cover about 10% of federal spending. 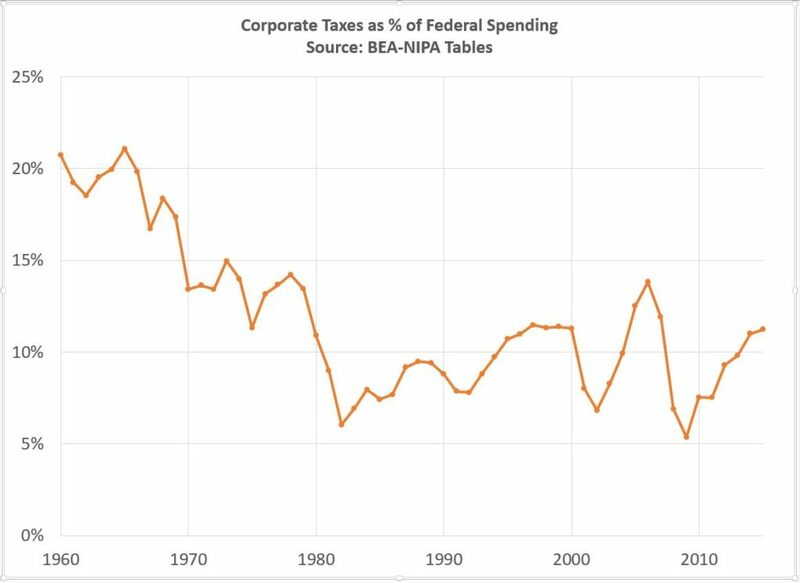 Here is the trend chart for 1960 through 2015 of corporate taxes as a percent of federal spending. The average for 1980 through 2015 is 9.3%. Of course corporations would still pay local taxes to states and communities to cover the cost of supporting infrastructure and state and local services. They do need police and fire protection and highways, after all. One way to look at these figures is that we are collecting about $400B a year in corporate taxes and paying out about $500B a year in “boot” to foreign companies, both of which are taxes on US consumers. So, Mr. Trump, how about going back to the drawing board on these issues, and let’s see if we can reduce the tax burden on US citizens and put the country back to work with jobs that support families and college educations. Yuuge, indeed. Perhaps to simple for politicians, tho. …perhaps Trumps aids will read it and tell him about it. After all, he says he doesn’t read. Putting it in terms of “boot” makes it too simple for many to understand. I think your thoughts on taxes are right-on and also too simple for the bureaucrat.